SA Hot Water™’s research has found that the best hot water system to buy is a natural gas 5 star continuous flow hot water system as they are the most economical to run. Based on an average household’s hot water usage of 200 litres of hot water per day they will cost approximately $484 per year to run ,compared with a natural gas 3 star storage hot water system at $896 per year. A 5 star continuous flow gas hot water system will on average save $412 per year compared to a gas tank hot water system. As the price of gas increases this difference will be even greater. Gas Storage water heaters or gas tank systems use a gas burner positioned beneath the a storage tank which will heat the water. This style of hot water system has a pilot flame that will ignite the main burner when the temperature in the tank reduces below the set temperature of the thermostat. This pilot flame uses an estimated $50 – $100 of gas per year.The most common tank is made from mild steel, however stainless steel tanks are also available and will generally last longer. Mild Steel steel tanks have a sacrificial anode installed inside the tank to prevent corrosion which will need to be replaced on a regular basis and this will depend on the TDS in the water. Stainless steel tanks do not require a sacrificial anode and therefore have less maintenance and will last much longer than a mild steel tank . Gas storage water heaters have a thermostat and are normally set at 60 Celsius or higher to ensure legionella will not form within the tank. Keeping this tank hot all the time at times when you’re not at home or overnight will waste gas and cost you money for heating unused water. 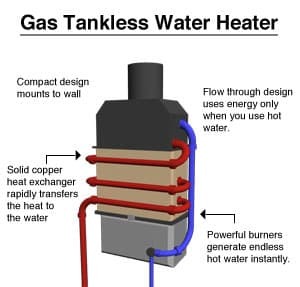 Gas hot water storage tanks will lose heat through the sides of the tank (called standing heat loss), this will see the burner fire up to maintain a constant temperature within the tank. The losses can be a significant amount of your hot water energy bill. Instantaneous heaters, or continuous flow hot water heaters can provide an endless supply of hot water . The burner is activated when a hot water tap is turned on and water is heated as it passes through a copper heat exchanger. When the tap is turned off the burner goes off. Instant hot water systems are much more energy efficient than storage tank system as they don’t store hot water and only heat the water that is used. As they don’t store any hot water there is no heat losses so therefore there can be huge savings. The new Electronic version of continuous flow hot water heaters have an electronic ignition system built in to light the main burner and no longer require a standing pilot light which is another energy saving , This will also help people who have problems with pilot light being extinguished due to high winds. Gas Hot Water Adelaide Best Price!